Jon Favreau has made a big name for himself with the first two Iron Man movies and with being one of the producers of The Avengers. His credentials range from action blockbusters to comedies, acting to directing and much more. He’s just a big film fanatic that wants to give all of the fun and conventional genres a shot, and sometimes he wins (the previously mentioned films) and sometimes he doesn’t (Cowboys Vs. Aliens, Couples Retreat). The fact is, however, that he does have the capabilities of truly blowing audiences away, and he does so commercially and in large numbers. He has gone to direct, produce, write and star in Chef, and with such control over this film, it is almost flaringly obvious that he made this movie with analytical people (such as yours truly) in mind: Critics. Before I have even talked about Chef, I have discussed that he has made both good and bad films. I’ve recognized that he has had off days. 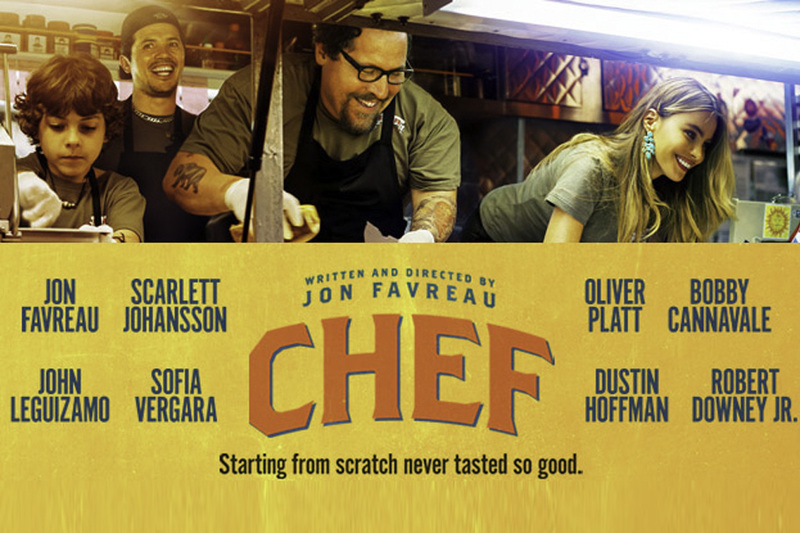 This film starts with a celebrity chef (played by Favreau) having just one of those days. It’s a story of passion, determination, and, most importantly, the right to try again. When his cooking is harshly shredded by a food critic (when the dishes prepared were not up to him but by the restaurant’s owner instead), he is personally affected because this isn’t a depiction of his true self. After a second episode with the same food critic testing the same lousy dishes again, the chef screams in front of an audience of guests, phones in hand and actions sent into cyberspace. This is Jon Favreau serving his own soul on a plate for us. His performance is good, but we don’t feel the emotions channeled through his character: We feel it through the truth in the script. There’s no doubt that Favreau has taken part in films with horrible ratings, and this is his experience being exposed. He becomes familiar with social media, and that aspect too feels personal to Favreau. He is aware of the fragility many famous faces have online despite their abilities to hide behind their screens, and he makes it known how rewarding and damming such an easy access to the entire world is. It is through twitter that he called his biggest critic back, and it is through social media that his rant was uploaded online for the same citizens of the world to laugh at. It’s a very depressing scene, despite its capabilities of hilarity shining through (maybe to the more cynical people, perhaps), and it’s one that made me, a critic, want to listen instead. What was to come to my table now that I’ve got the story straight? Favreau leaves the kitchen to become a cooker in a food truck. It’s humiliating but it has a capability of working out with the right ambition. The chef has that spark, and so does Favreau. Anybody who has been in a tough situation where starting fresh is the only option will experience a scene much like the one where Favreau and his son (played by newcomer EmJay Anthony) are cleaning a heap of scrap formerly used as a food truck. It isn’t a sad scene, but instead an upbeat one. In those situations, you just do what you have to do, and despite the film being about financial hardship, it is incredibly optimistic and not in the ironically malevolent way. It never makes you feel like a jerk by rubbing their efforts in your face as do many feel good movies. This truck is the film itself. Favreau craves the blessing to cook whatever he wants, and he was always sheltered by the restaurant owner (played by Dustin Hoffman) to make basic dishes. He leaves to make his own dish. In the film, he goes all out with his recipes. The film itself doesn’t really go all out, however. In fact, it feels like it’s still catered to the larger crowd. Perhaps it is a more abstract symbol? Maybe the food in the film is complex but his film as a whole is just something he wanted to make and not a project of intricacy. His journeys of old and new are filled with a star studded cast. His ex wife and good friend is played by Sofia Vergara, his chef friend is played by John Leguizamo (another chef friend is played by Bobby Cannavale) and the food critic is Oliver Platt. Featured in two small cameos are Iron Man alumni Scarlett Johansson (a hostess of whom you don’t see often) and Robert Downey Jr. (Vergara’s ex husband of whom you really don’t see often). While everybody does a good job, it often feels like the majority of the casting decisions were made out of who Favreau wanted to work with instead of who could deliver the most to these roles, and that’s mostly because of how light the film is. I’m not entirely sure if anyone (save for Favreau, Vergara and Leguizamo, who are on screen the most) could have made that feat possible though, as the film would have still required very little challenge from almost everyone involved. Either way, the cast was charming (even the prodding Hoffman and smug Platt were likable) and the choices didn’t hurt the film one iota. The only major drawback to this film is that it has the odd story issue that is never truly realized. With a film where the main character is down on his luck, you want to see fruition in every aspect of his life no matter how uplifting or serious the film is. There is a moment that hints that life between him and his ex wife may go back to how it once was, but you don’t see anything come from that after. Once things start going well with the food truck, the movie, emotionally, feels like the final five minutes of resolution found in most films for at least an hour. This is only a problem depending on your personal tastes, though, as it was still a long period of cheer and not a stale WalMart greeting on repeat for eternity. However, the biggest story flaw is one that sadly doesn’t seem up to the audience member as I doubt there is anyone who likes a film that just ends. This isn’t a film that ends on a question; that would be interesting. It just ends on the constant happy note it has been riding for the last hour. The first half was a fun roller coaster ride full of loops and rolls, and the final hour is the ride on flat ground heading back to the front of the ride as slowly as possible. Despite being uneven, it’s still a pleasant film with something to say. I don’t think Favreau will care about the reception of this film because he’s had his word on the matter thrown out there. It’s like his tweet: Impossible to take back. I have a feeling that many will be on his side, though. He has obviously put a lot of effort into making his statement on both the cooking industry and the critiquing of any industry as he throws in subtleties to create a real environment (the chefs having permanent burns on their hands and arms was a very nice touch). As stated, the film is represented by the food truck. It has come for a while and it is sure to leave soon. You may not like what was cooked, or you may very well love it. It certainly doesn’t hurt to try what Favreau has served up for us this time around.